The British neo-progressive band HAZE was formed in 1978 by Chris and Paul McMahon. 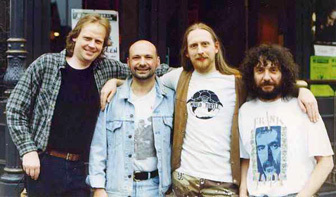 The Sheffield group remained quite inconspicuous during its ten-year existence, playing all but a few dates inside the U.K. and releasing only two true albums, both of which were vinyl-only. Within Great Britain, however, Haze was popular to a small cult of fans, which followed the band for over 500 live performances -- usually reached by means of an old beat-up ambulance. Varied lineup changes kept the group from accomplishing much before 1983, but by the following year, the McMahons had set up the Gabadon label and released C'est la Vie. The following two years brought a frenzied touring schedule, and the release of two cassette-only albums, Cellar Replay (1985) and the live Wart's 'N All (1986). Haze's final album, Stoat & Bottle, was issued in 1987, and the band broke up a year later. In 1996, the Kinesis label released a best-of entitled In the End. — John Bush.